The diplomatic feud between Saudi Arabia and Canada, triggered by a tweet criticizing the Gulf kingdomâs human rights record, looks set to worsen this week with the suspension of direct Saudi flights to Canada. Neither side is showing signs of wanting to ease a quarrel that flared when Canadaâs foreign minister criticized the recent arrests of 11 prominent rights activists in Saudi Arabia. Following the tweets posted August 5, the feud has only worsened, with media in both countries piling on and urging government officials in their respective countries to not back down. The Saudis have expelled Canadaâs ambassador and recalled their own envoy from Ottawa, ordered home 15,000 scholarship students studying a t Canadian universities and hospitals, and frozen bilateral trade and investment, including halting barley and wheat imports. Both governments can benefit politically from the standoff when it comes to domestic politics, say analysts, who suspect the feud could play out for some time. 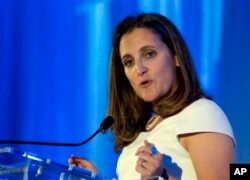 FILE - Canadian Minister of Foreign Affairs Chrystia Freeland speaks after receiving the Foreign Policy's Diplomat of the Year 2018 award. The diplomatic spat took Canadian officials off guard. They say the tweets by Canadian Foreign Minister Chrystia Freeland protesting the detention of female critics of Crown Prince Mohammed bin Salman, the kingdomâs de facto ruler, were hardly unusual and amounted t o routine critiquing of the Saudi rights record. They accuse Riyadh of an absurd overreaction. But analysts say the sharp reaction by Riyadh may have less to do with Canada and more to do with domestic Saudi politics, fitting in with a recent pattern of aggressive Saudi behavior that has seen Riyadh engineer a standoff with Gulf neighbor Qatar, which it is blockading, and continuing to pursue the war in Yemen, despite allegations of human rights violations. They say the crown prince appears to be ramping up Saudi nationalism to try to reduce the risk of a reactionary backlash from conservative clerics and their supporters in the royal family to a series of reforms the crown prince has implemented, part of a high-profile social and economic modernization program designed to refashion Saudi Arabia thatâs been unfolding the past two years. The reforms include allowing women to drive, opening movie theaters, and allowing concerts. Economic modernization, incl uding welcoming greater foreign investment, is designed to reduce the Saudi economyâs dependence on oil. âNo one should interpret this as a tantrum from Riyadh,â tweeted Hisham Al-Zoubeir Hellyer, an analyst with the Atlantic Council, a U.S.-based research group. âIt is far more likely to be a calculated move, designed to establish a new litmus test internationally for continued relations with Saudi Arabia. The question is whether or not everyone will buckle or refuse." The Canadian government shows little sign of backing off, although Prime Minister Justin Trudeau has acknowledged recently that Saudi Arabia has made progress on human rights. Much of the Canadian media is supportive. âWe should not apologize, and we should be ready to accept further retaliation from Riyadh,â wrote Jim Warren, a columnist for the Toronto Sun. In its efforts to bring the Canadian government to heel, Riyadh has organized an apparently coordinated social media offensive, which has taken several bizarre turns, including targeting Canadaâs womenâs rights record, by accusing Canada of being one of the worst oppressors of women. One social-media posting, which was deleted after being linked to the Saudi government, warned Canada not to âstick its nose where it doesnât belong,â with the message superimposed over a photograph depicting a plane flying into Torontoâs CN Tower. In a tweet, Majumdar faults the Canadian government for the dispute, arguing it should have been more careful in how it campaigns for human rights, âOne doesnât just wave a wand or issue a tweet."